It's a tough problem to create a nuanced and believable setting in a game that's really just a series of multiplayer maps and objectives. Edward Stern has his work cut out for him. 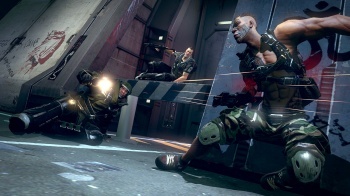 The lead writer of Brink was certainly excited to work on Splash Damage's first original IP - having previously created Wolfenstein: Enemy Territory and Doom 3 - but it was more difficult for him to develop a story without a defined protagonist. The Lead Writer title is a bit of a misnomer, as he is the only writer on the team, but Stern had the significant challenge of pulling players into the new intellectual property without heavy-handed exposition. That's especially difficult with a game that focuses heavily on multiplayer and coop, without a separate single player "story mode" - a gametype dubbed "crossplayer." When Brink comes out May 17th on PC, Xbox 360 and PS3, players will create their avatar and be able to jump into any mission with their friends or solo on the fly. But with such gameplay, Stern was still able to craft a coherent story by using the environment. "It's just better when players pull information [out of the game] rather than the game pushing it at them," Stern told me at PAX East 2011. "We can render environments really well, but it's really hard to do convincing characters." The story of Brink is that a huge floating island designed to be a self-sustaining refuge for the fabulously rich is flooded with refugees when the seas rise in 2045. The Ark cannot sustain so much population, and tensions are rising between the original inhabitants and the "guests" - a sort of slur describing the poor newcomers. The technology for these "sea steddings" exists now, and it's a perfect setting for a first-person shooter because of the isolated environment. "We wanted it to be real," Stern said. "We didn't want [Brink] to be too far in the future ... because that turns into sci-fi and that turns into magic. We'd lose that sense of immersion, that's what shooters are good at. That feeling of, 'Oh my god. That guy is shooting at me.'" The Ark becomes the main character in Brink, and the players can participate in 8 different maps or scenarios for each faction - the Resistance or Security - and get a sense of a continuing story. But there is no good or bad guys on the Ark as it teeters on the brink of full on civil war. Stern gave a great example how one mission can be viewed completely differently, depending on which faction you are playing. "If you play the Security storyline, we've got credible intel that there is a bio-weapon lab. So you go, 'That's what that map is about,'" Stern said. "You play that [same map] from the Resistance side and they say, 'They're stealing our vaccine.'" Once you realize that vaccines are made from viruses, which could be used as bio-weapons, a simple mission suddenly has a lot of grey area morality that will hopefully engage players. Another way that the writing filters into a multiplayer game is through art design. The Ark was meant to be self-sustaining, but in the areas that are overpopulated with Guests, the metal has been allowed to corrode. Red colored environments denote poor or Resistance areas, where as pristine white coral is the color of the rich and powerful. Taking a cue from games like BioShock, Stern has written audiologs that will populate your dossier - an in-game database - that will unlock as you earn XP. These logs will provide the inner thoughts of the leaders of the two factions, Captain Mokoena, leader of Security forces, and Brother Chen from the Resistance. "It's a total game-ism," Stern said of audiologs. "But's it's just too handy." Unlike other games, Stern felt that playing the audiologs over play was too disconcerting in a multiplayer game, so instead they are accessible as a reward from the menu screens. But will there be a climax? Will players feel like they've accomplished something after they play through all 16 missions from both factions? "Once you play eight missions from the first faction, there will be a end of campaign movie that will ask you, 'Do you want to see the other side of it?'" Stern said. "Then once you finish the second eight missions, there will be an outro cinematic that will resolve or conclude the story." Brink attempts to break new ground by offering a story within a game that is built completely on multiplayer. It's hard to tell if playing one mission cooperatively, or against other players, will work and if the narrative will feel coherent once the game is out, but at least it seems like Stern and the Brink team is trying something new and interesting. Hopefully, this new angle on storytelling will dovetail nicely with the innovations made in shooter gameplay that the game offers as well. Check out my impressions of playing the multiplayer of Brink hands-on.